OK, I’ll admit this project is time consuming, but the result makes the effort worth it. Bake and cool leaf shaped cookies according to No Fail Sugar Cookie Recipe. 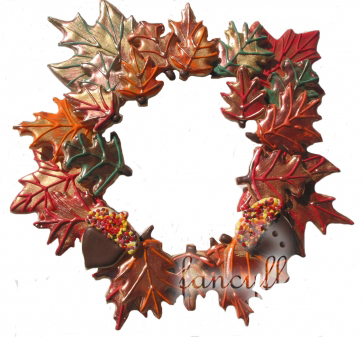 You will need approximately 30-36 assorted shaped leaves to make each wreath. Our wreath measures 14” in diameter. You can easily downsize to a smaller wreath, if you wish. Ice cookies with colored Royal Icing. After the base coat dries you can make veins on the leaves with the same color or another color. Once dry, apply luster dust mixed with an alcohol base (an extract will work) with a paintbrush to the desired section of the cookie, leaving some of the base and vein to show through. After you have completed the cookies you need to prepare your cake board. Make sure that you have enough cookies to cover the area of the board. Using scissors or a razor blade to cut a hole in the middle of the cake board leaving a ring to glue the cookies to. Using Royal Icing, attach cookies on un-waxed side of cake board. Attach a base layer of cookies down to the board (larger cookies work best here). Keep layering/ staggering the cookies until you reach the desired look (3 layers). Let the wreath set until royal icing is completely dry before hanging! Hang the wreath by wrapping 2 short pieces of fishing line around the top left and right sides. Attach a third longer piece to the two smaller pieces to create a hanger. This is absolutely gorgeous and so appropriate for those of us who for some crazy reason love to spend hours and hours doing intricate things. You’ve added to my addiction—-augh!